2018 is the year of the birthday party – and RFM is giving away parties all year long to celebrate. 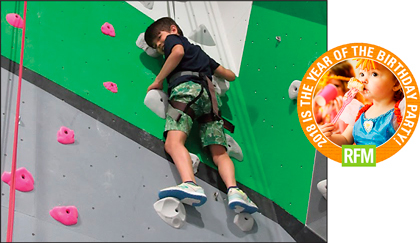 Designed for kids four and up, a Triangle Rock Club party includes the use of a private party room and kitchenette, two hours of active fun, TRC goodie bags, and all necessary climbing equipment. Personal belayers ensure everything goes according to plan from start to finish. Plus, the birthday child receives a free TRC birthday shirt. No purchase necessary to enter. All giveaways are sponsored by Richmond Family Magazine. Giveaways are open to adult residents (18 years and over) of the Richmond, Virginia, metro area. Winners are drawn at random from all sweepstakes entries. If winner declines prize, RFM is not obligated to offer substitutions or upgrades. Winner(s) will be notified via email the first business day after the end of the sweepstakes month or after a unique drawing date as indicated. If winner does not contact RFM within three days to claim prize, a new winner will be drawn.